We awoke to a gorgeous Saturday morning. I had planned to post this recipe last night but actually fell asleep much earlier than planned and didn't get to it. So, I made a fresh batch of my No-Flip Berry Pancakes for breakfast this morning so hubby could enjoy them, too. They are sort of a breakfast version of "strawberry shortcake"...or "strawberry short-pancake". I did a test batch Thursday night while he was in a meeting after work. I actually had that as my dinner that night. 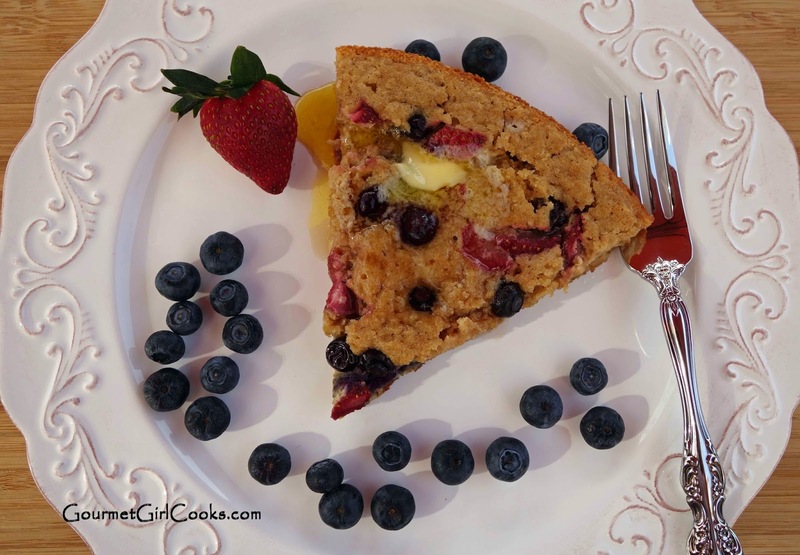 In this morning's version, I added both strawberries and blueberries. I was so excited for hubby to try it (as many of you know, he is not grain-free like I am). He absolutely loved it. I love this recipe for a variety of reasons...one of them being that the thing I absolutely detest the most about making pancakes is making them one at a time and flipping them. When I made my pancake batter Thursday night, I initially started making them the traditional way (flipping them one at a time). After the first batch, I found myself thinking "this is for the birds". Just the night before I had made Sausage Broccoli frittata...and suddenly that little light bulb went off again. 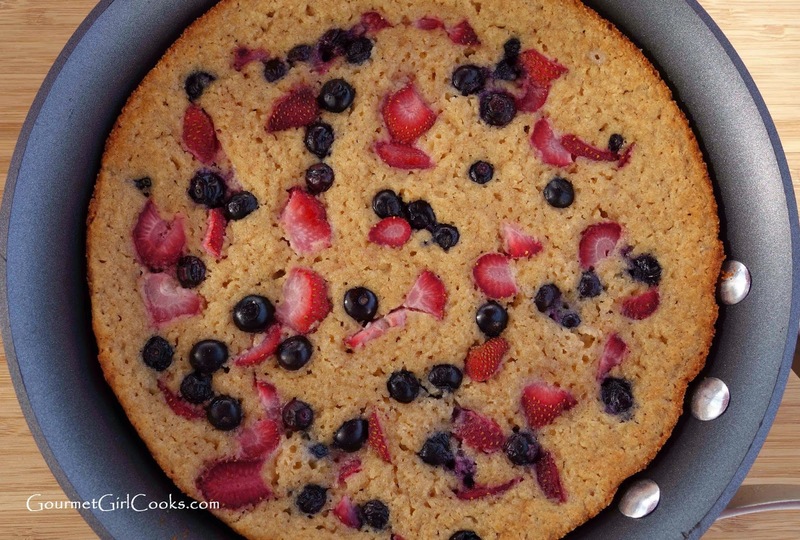 I turned my oven on, grabbed the bowl of pancake batter and poured it all into the hot skillet and cooked it on the stovetop for a couple of minutes and added sliced strawberries to the top, then sprinkled some granular sweetener over the berries and popped it into the oven and baked it. It turned out fabulous...like "happy dance fabulous". To give some added maple flavor to my pancakes, I used some natural maple extract and added a bit of sweetener to my batter and then scattered a bit on top so they wouldn't need much syrup. I slid the baked pancake onto a cutting board and cut it into wedges (just like I did with the frittata). I served these amazing pancakes, with a pat of Kerrygold butter and just a drizzle of maple sugar free pancake syrup. I will never flip pancakes again! I snapped some photos below as well as the easy peasy recipe. Enjoy! 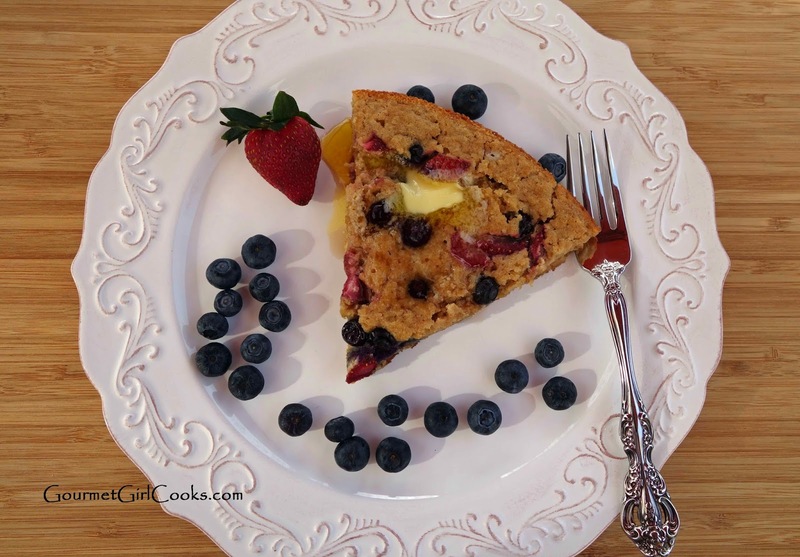 Grain-free breakfast heaven...I will never flip a pancake again! In a large bowl, combine almond flour, flax, coconut flour, 3 tablespoons sweetener, baking powder, baking soda, salt, and cinnamon; whisk to combine and break up any lumps. In a separate small bowl, beat buttermilk, egg, coconut oil and maple flavor together. Stir wet mixture into dry mixture; mix just until combined. 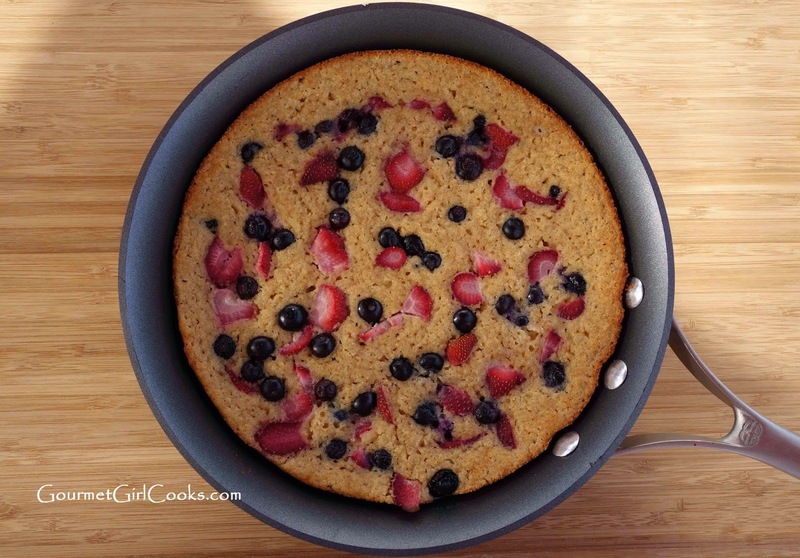 Heat a 10-inch ovenproof nonstick skillet over medium high heat until hot. Spray or brush pan with coconut oil. 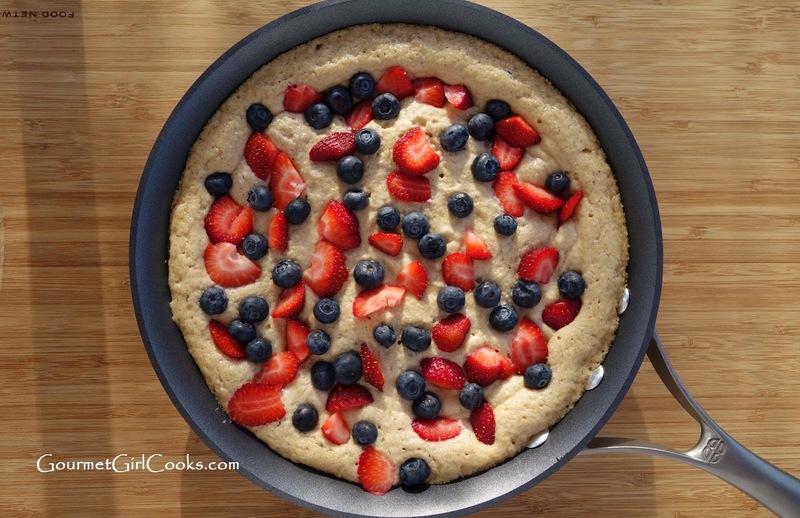 Pour pancake batter into hot skillet; top with sliced strawberries or blueberries and sprinkle with remaining 1 tablespoon sweetener. Cook on stove top for about 2 minutes. 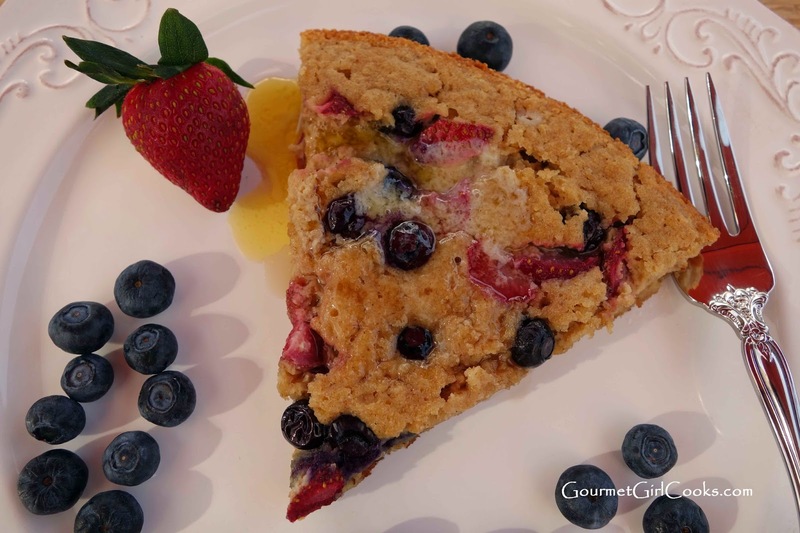 Place skillet into preheated oven and bake for about 25 minutes or until pancake is cooked in the center and doesn't jiggle when gently shaking the skillet. Let set in pan for approximately 5 minutes. Use a rubber spatula to gently loosen and slide onto cutting board. 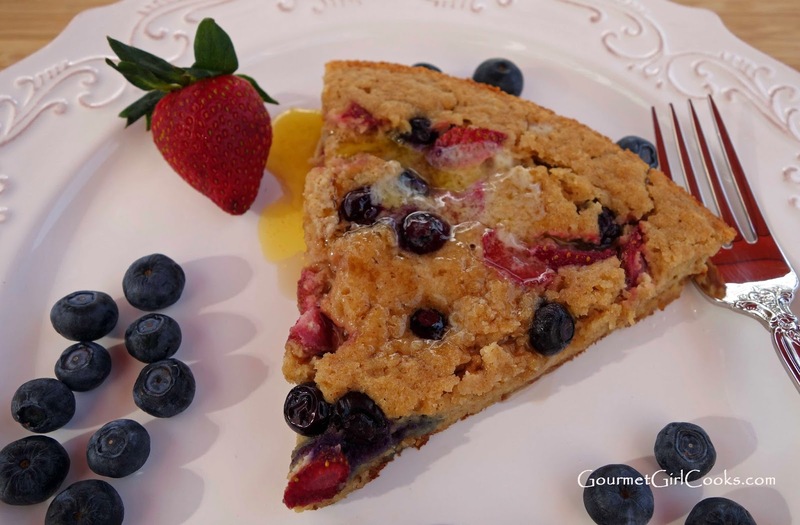 Cut into wedges and serve topped with sugar free maple syrup or additional berries, if desired. 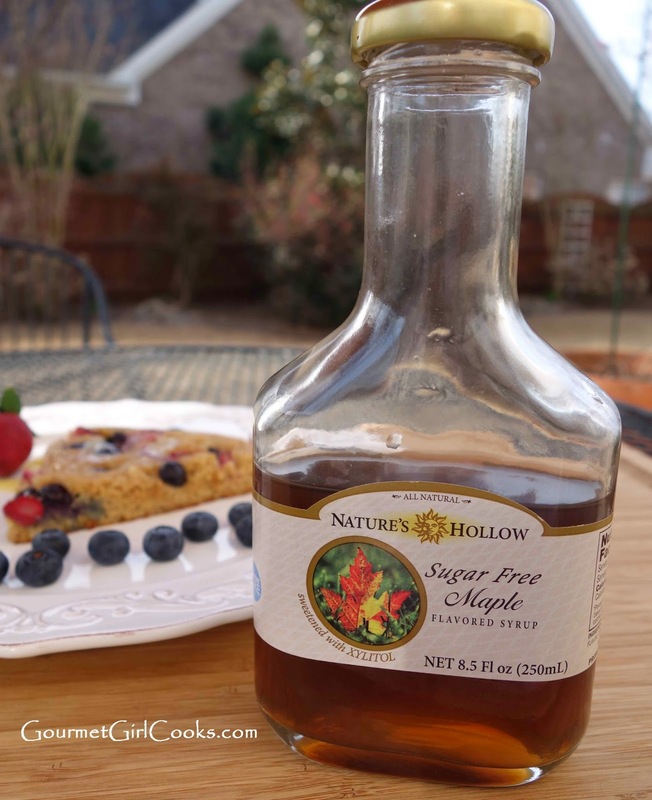 **WARNING: Most sugar free syrups contain xylitol. It is deadly to pets -- do NOT share any foods containing xylitol with your pets. Also be careful when using any granular type xylitol sweetener (Swerve does not contain any xylitol). You're a genius. I mean it! Well, I've seen "genius" lots of times in the "comments" on this blog! And I couldn't agree more. I knew it about this recipe the moment I saw the "teaser" photo the other day. I love it when that light bulb goes on! Hi Loretta -- Thanks so much! So glad you enjoyed the no-flip pancake! I hope you enjoy the meatloaf and sesame seed buns too!